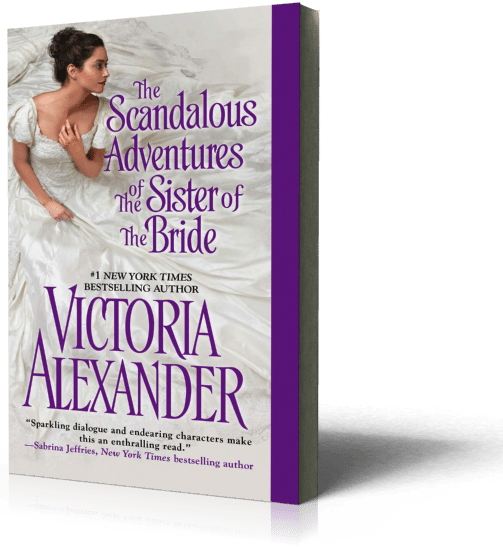 In advance of the release of The Scandalous Adventures of the Sister of the Bride I sent out four newsletters with excerpts and background info. 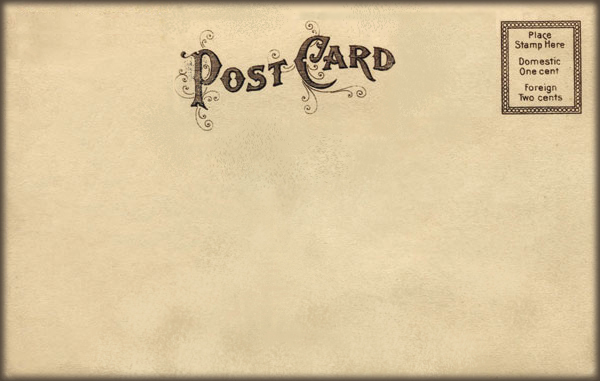 Now I’ve put everything into one post so you don’t have to move from page to page. This is more or less the story behind the writing of the Scandalous Adventures of the Sister of the Bride. 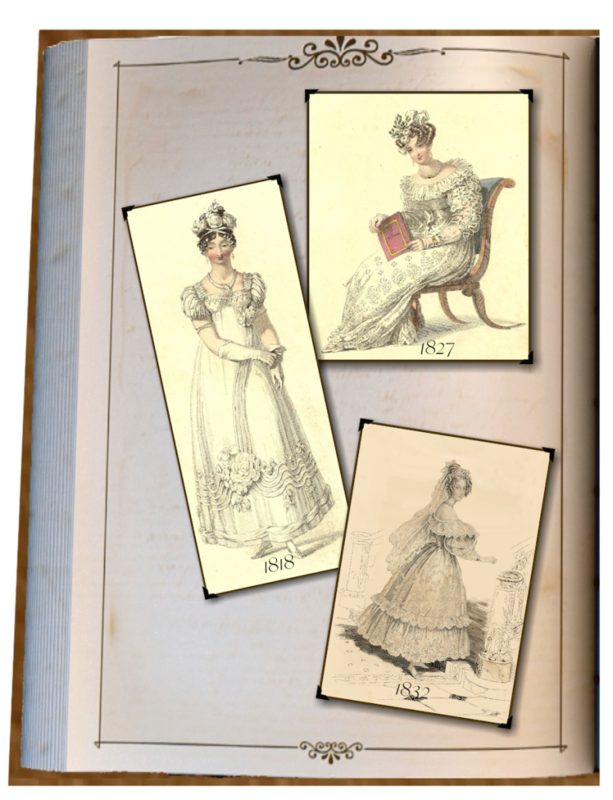 Scandalous Adventures is the story of Delilah, Lady Hargate, who has always been very proper and respectable. 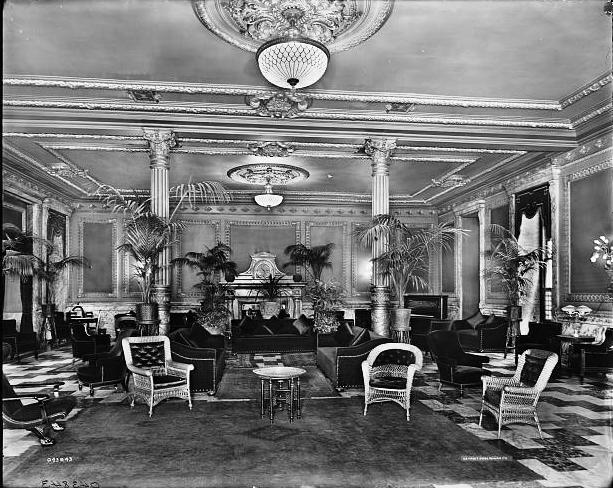 Until one night in the Murray Hill Hotel with handsome American entrepreneur Samuel Russell. One unforgettable night. 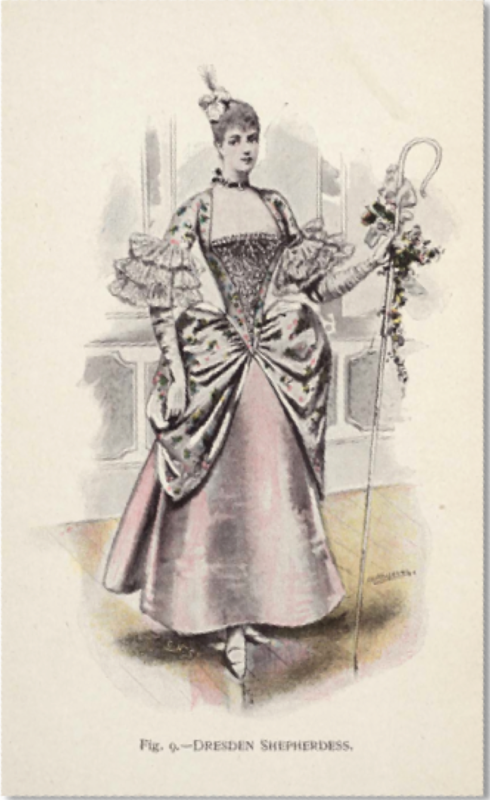 DRESDEN SHEPHERDESS Crimson petticoat, three plaited flounces: top flounce, pale yellow: second, pale pink: third, pale green: white overskirt, with brocaded bouquets in blue and crimson: elbow sleeves, with broad band and ruffles round stiff square bodice: pale green apron, lined with pink: hair powdered: flat shepherdess hat slung on arm: Watteau bow round throat: high heeled shoes. And Lady Hargate apparently wore it quite well as she was reminded in this excerpt when Sam, her mistake, shows up at Millworth Manor for her sister’s wedding . . . There was something about the way he said her name that was at once sensual and irritating. And unnerving. She tugged again at her hand. “I can’t imagine anyone not remembering.” Grayson chuckled. “It was a costume.” Delilah yanked her hand from Mr. Russell’s. It wasn’t bad enough that her mistake had appeared from out of nowhere but now her sister had to chastise her as well for her choice of costume. This day was not getting any better. Oh, but I haven’t mentioned Delilah’s mistake yet. Well, that brings us back to the Murray Hill Hotel. 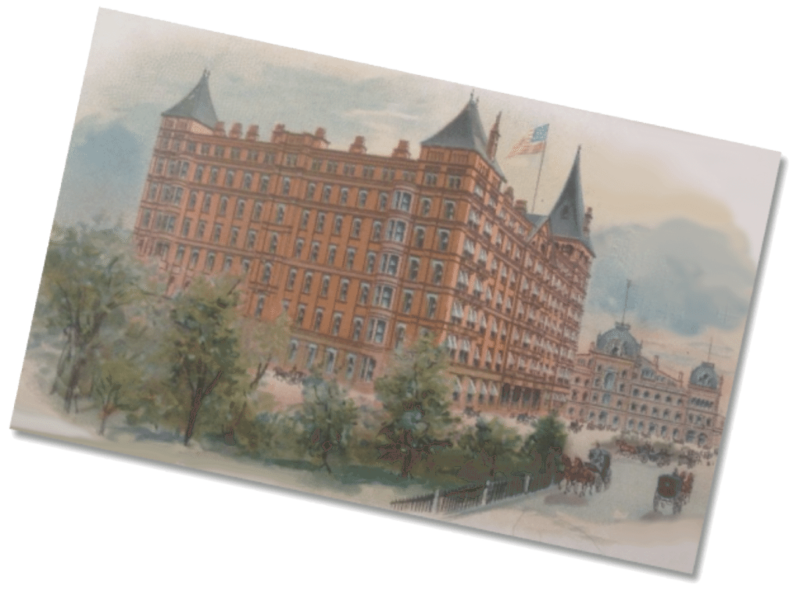 With eight stories and six hundred rooms the hotel on Park Avenue between 40th & 41th Streets was quite the place to stay in 1887. Mark Twain stayed here as did P.T. Barnum, Diamond Jim Brady and Presidents Grover Cleveland and William McKinley. 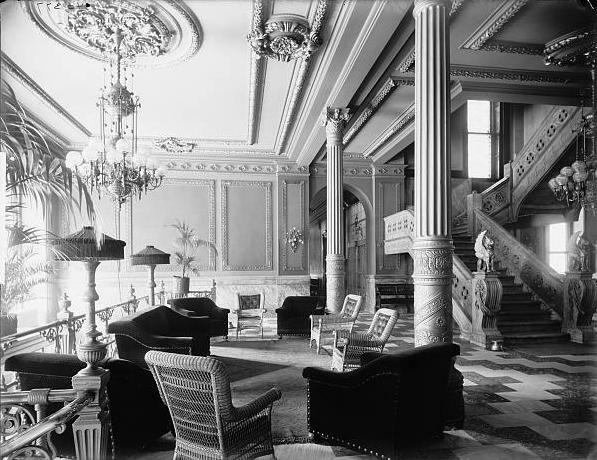 The hotel opened in 1884 with two restaurants (offering diners a choice of European or American service), marble stairway, electric chandeliers and even an ice making machine. 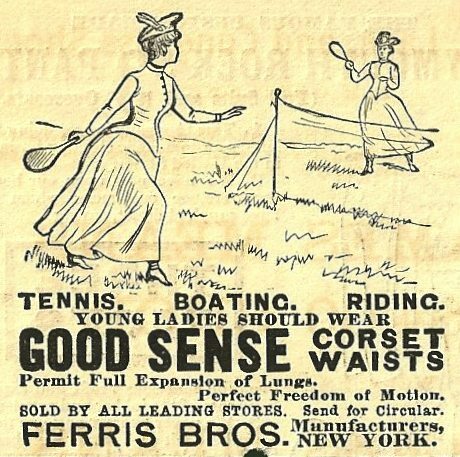 Very 1880’s high tech! 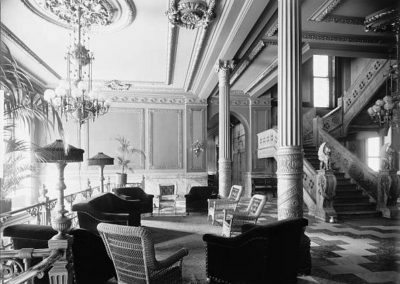 This was the site of the masquerade ball where Delilah fell to Samuel’s charms and he fell every bit as hard for hers. But then what Dresden shepherdess wouldn’t succumb to a dashing pirate? And what pirate could ever resist the well-turned ankles of a shepherdess? Of course a masked ball is one thing. The next morning is something else entirely . . .
“Do hurry with that.” Delilah, Lady Hargate, cringed at the sharp note in her voice. She did so hate to be rude especially after, well, after everything but she wasn’t used to being in this position. She’d certainly never been in this position before, never imagined she would, and really had no idea how she now found herself here. Nor did she have any idea how to gracefully extricate herself although she suspected graceful was no longer possible. “If you would be so good,” she added as politely as she could, even while knowing that minor attempt to atone for her impatience made no difference. Courtesy battled with honesty although perhaps this was not the time to be polite. “No, we would not.” Her jaw tightened. Discovery was the last thing she wanted. Before I started writing fiction, I thought it was easy. I thought because I wrote news (I used to be a television reporter) and because I was a voracious reader, fiction would be a piece of cake. Well, at least I’m willing to admit when I’m wrong. I do a lot of research. 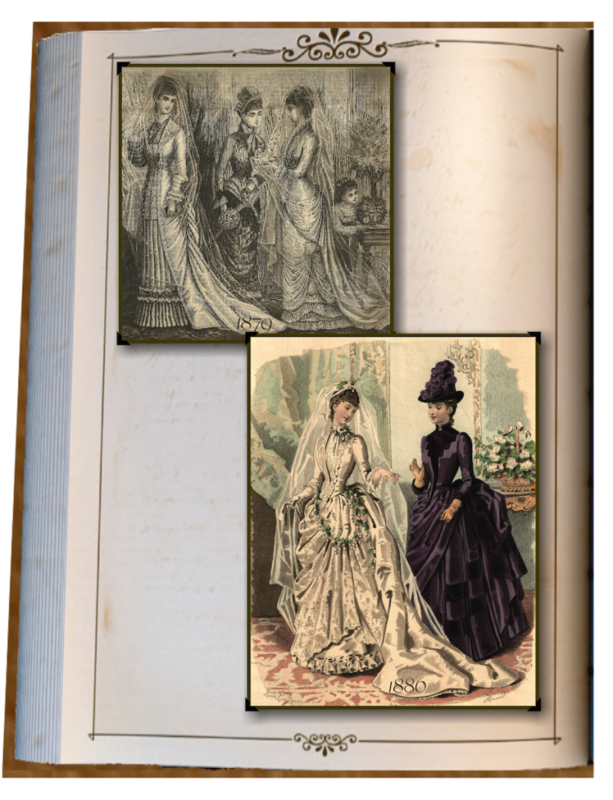 In the Scandalous Adventures of the Sister of the Bride—set in 1887—the very respectable, proper, and oh so traditional Delilah, Lady Hargate, finds herself pitted against Samuel Russell—a self-made, new money, extremely progressive American entrepreneur. 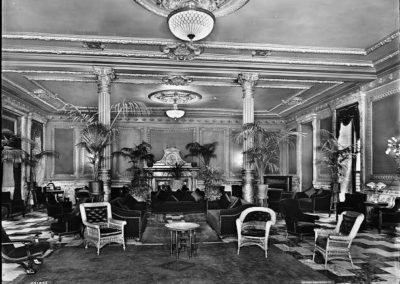 Aside from one glorious night in a New York City hotel room, which Delilah thinks would be best forgotten, she wants nothing to do with the dashing American. 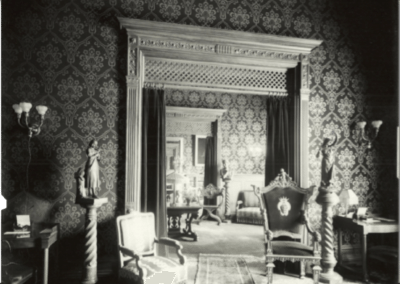 Pity then that he showes up at Millworth Manor for the wedding of her sister Camille to Grayson Elliott. In addition to all the other reasons why Delilah thinks she and Sam are wrong for each other, Sam is investing in horseless carriages. He’s actually bought a motorwagon from Karl Benz and brought it to Millworth Manor. Oh and horseless carriages wouldn’t be called automobiles until about the mid 1890’s. 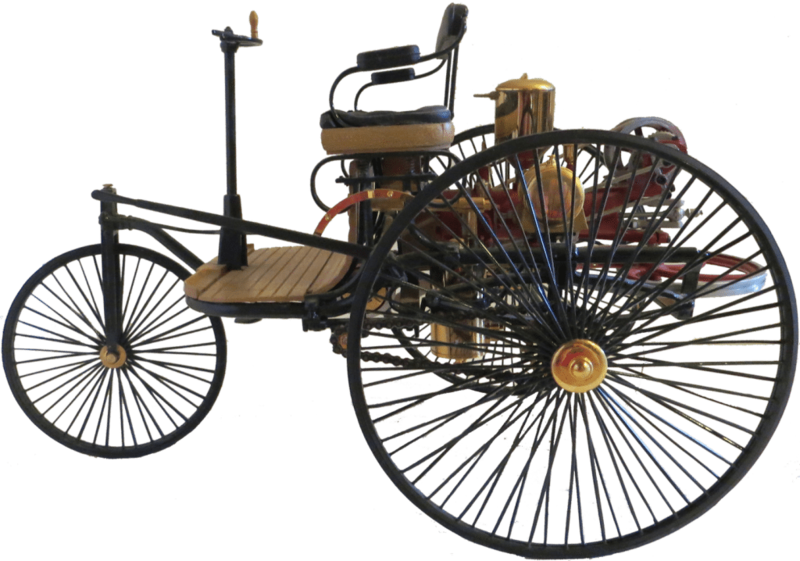 This is a scale model of a 1886 Benz motorwagon. But as much as Sam thinks motorwagons are the way of the future, Delilah thinks they’re ridiculous. And when the conversation at dinner turns to motorwagons, well, Delilah does try to keep her opinions to herself . . .
Delilah stared for a moment then swallowed a laugh. Laughing would be rude. “Really? How fascinating.” Teddy fluttered her lashes at him but in the flickering candlelight Delilah might have been mistaken. “Do you truly think they could ever replace horses?” Camille asked. Better to keep her mouth shut entirely. Yes, that was an excellent plan. “That’s rather farfetched isn’t it?” Teddy’s brow furrowed. “Not at all.” Samuel paused while a footman removed his empty plate. How on earth did he become so successful? Was the man mad? He was so obviously wrong. “Ultimately, I think a horseless carriage would be much more efficient than a horse,” he continued. Absolutely, completely and without a doubt wrong. Someone should tell him how very wrong he was. Delilah glanced around the table. Teddy and Camille were staring with rapt attention and Grayson was studying his friend with approval. Good Lord, they were all mad! As well as wrong. “One would hate to see you inconvenienced,” Camille murmured. “I think they’re most impressive.” Teddy cast the group a bright smile. “Have you ever ridden in one?” Samuel asked in a clipped tone. “You’ll get your chance soon enough,” Grayson said under his breath. “Actually, Mr. Russell—Sam, it’s not the beginning is it?” Delilah asked. 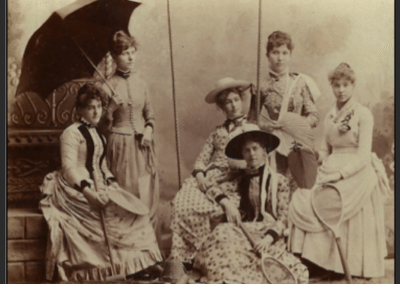 “I should have attended Miss Bicklesham’s,” Camille murmured. “And even that instructor accepted the basic fact that man will never be able to replace horses.” Delilah smiled in triumph and sipped her wine. “Until now,” Sam said coolly. “Perhaps the fault lies in you for not being able to control a horse,” Delilah said with a smug smile. “I daresay, most of the horses I know are far more intelligent than their riders,” Delilah said pointedly. “No more so than telephone or photograph, when one thinks about it,” Teddy said pleasantly. “That’s an entirely different matter.” Delilah adopted a lofty tone although he did have a point. For an endless moment, Samuel’s gaze locked with hers. Silence fell around the table. The oddest thought struck Delilah that this man was as exciting as he was annoying. She’d forgotten that or perhaps simply ignored it. “I’m so glad she apologized before dinner,” Camille murmured. Camille wasn’t alone of course. As late as 1903, a Michigan banker advised Henry Ford’s lawyer, Horace Rackham, not to invest in the Ford Motor Company saying, “The horse is here to stay, but the automobile is only a novelty – a fad.” Rackham invested anyway, borrowing $5000 to buy stock. He sold it 16 years later for $12.5 million. 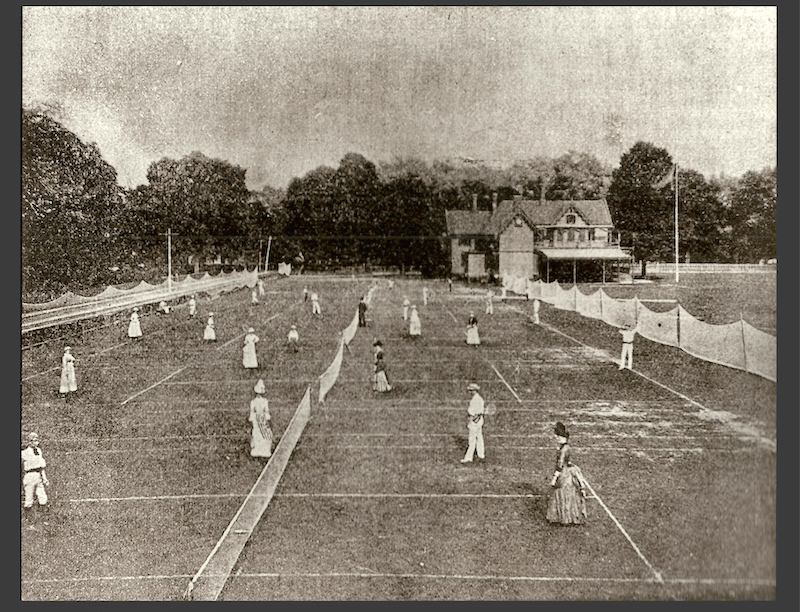 In the course of researching for a book, you often stumble across fascinating real life stories. 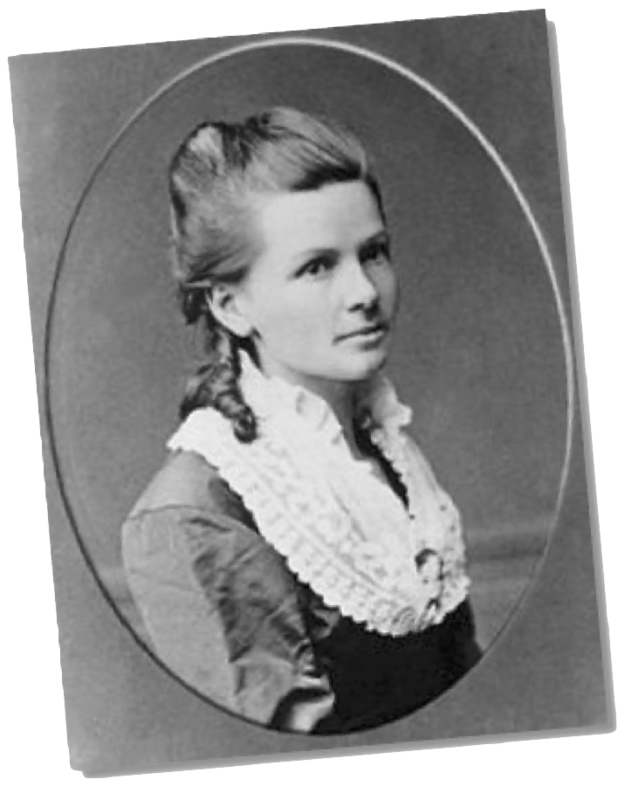 Meet Bertha Benz, Karl Benz’s wife and a true heroine. In 1888, she became the first person to complete a long distance trip by automobile. In an effort to support and publicize her husband’s work and without telling him (she left him a letter) or the authorities, she took her two sons and drove the motorwagon 66 miles through Germany to visit her mother. Along the way she unclogged a fuel pipe with a hatpin and used a garter to repair the ignition. By the time she returned home she had driven over 120 miles. Today, motorists can travel the path of her historic trip on the Bertha Benz Memorial route. Honestly, you can’t make stuff like this up. By the way, this isn’t the first time I’ve had a hero involved with horseless carriages. In The Princess and the Pea, the hero—a down on his luck earl—was working on his own automobile. 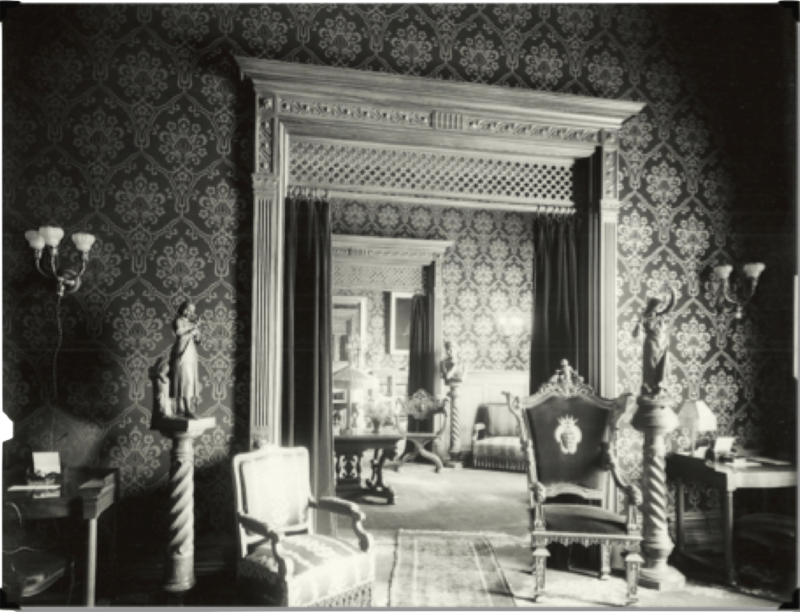 That was set in 1895 and the world of horseless carriages had come a long way from 1887. If you’re visiting Millworth Manor in advance of something like, oh, say a wedding you’re going to be in for a number of other events, gatherings and parties including at least one garden party. 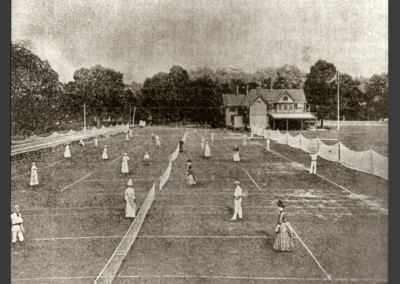 But at Millworth in 1887 that also means croquet and tennis. I’ve always liked playing tennis even if I’ve never played well. 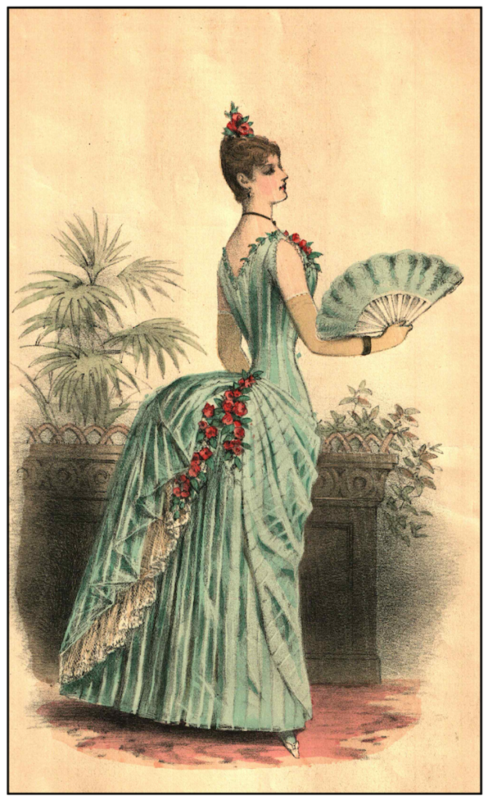 But then I never had to play in a long skirt with a bustle. Too bad, it would have given me a great excuse. 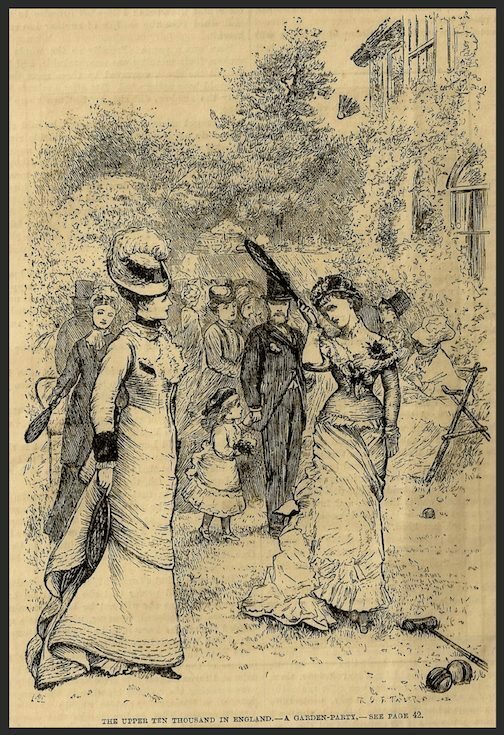 In 1887, that’s exactly how women played. These clippings are fron the 1880’s. And of course, underneath it all . . . 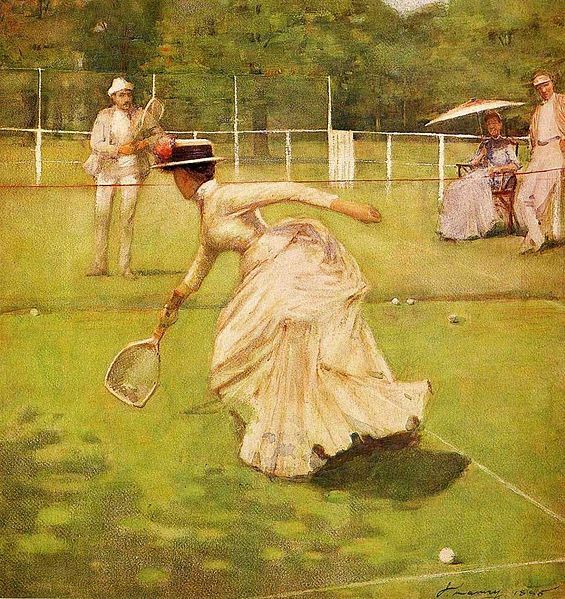 This is John Lavery’s A Rally painted in 1885. Beautiful dress. Looks a bit hot . . . 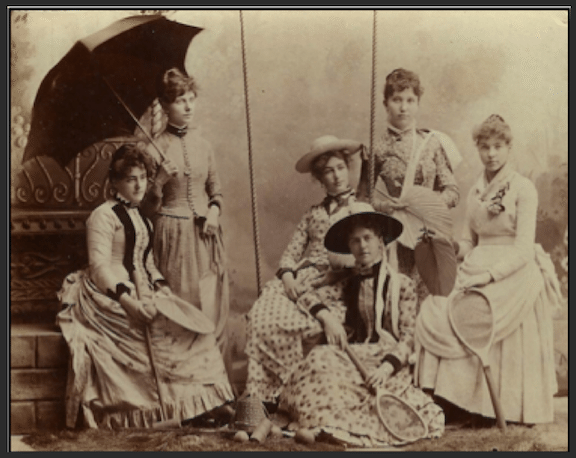 In case you think I’m making all this up with a few etchings and a painting, here are some 1880’s photographs of lady tennis players. 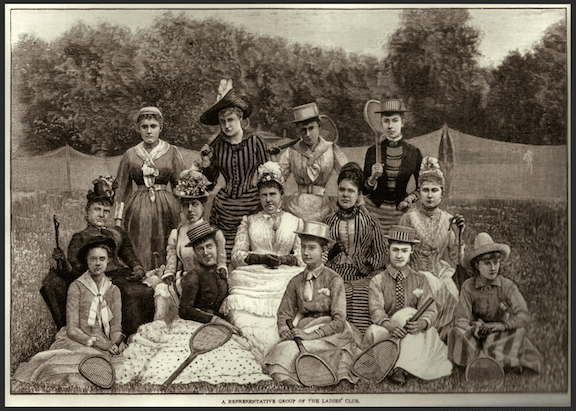 This is the 1887 Staten Island Ladies Lawn Tennis Club. Of course they don’t look happy—look at what they have to wear. And here they are in action! 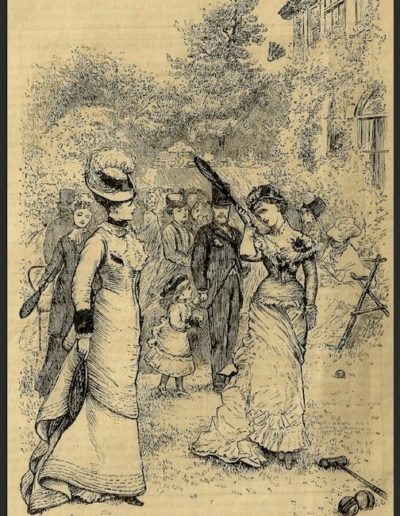 Just look at those bustles go. 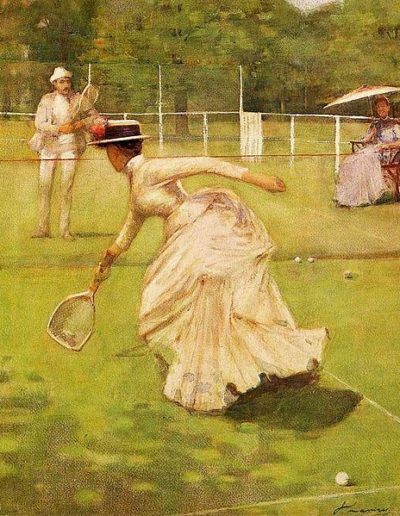 It takes a fierce competitor to do well under these conditions and Delilah, Lady Hargate, has always played to win. 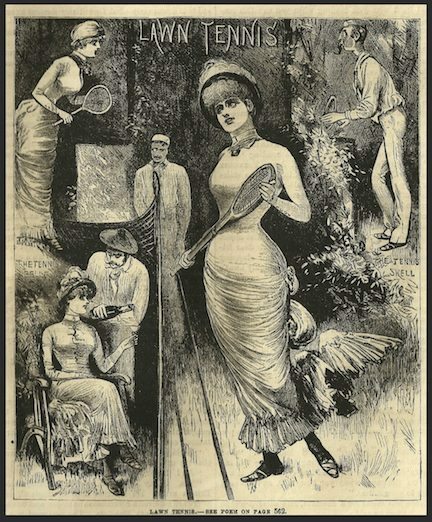 In this excerpt from The Scandalous Adventures of the Sister of the Bride, Delilah has just torn some garden party guests away from perusal of Sam’s motorwagon and is steering them toward the tennis courts. . .
Goodness, it was like herding recalcitrant sheep. 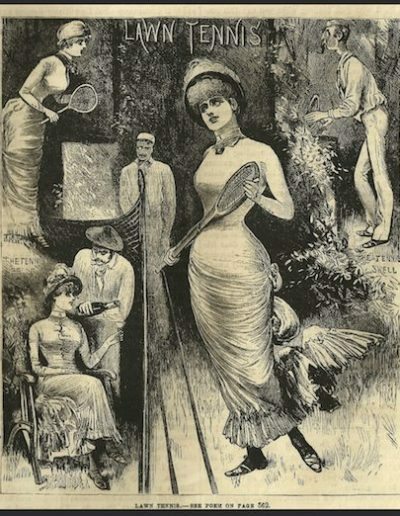 Delilah was tempted to smack Camille’s bustled backside with her racquet to get them all to walk a bit quicker. “I hope you’re a good player.” Sam caught up to Delilah. “I am.” She cast him a smug smile. They walked on in silence for a few minutes. “Of course not. That would be childish.” Although she had come very close to doing exactly that. He shrugged. “I suppose it depends on how you look at it. There’s nothing like a wedding at Millworth Manor! And the 1887 wedding of Camille and Grayson will be an affair to remember—in more ways than one for her sister. Delilah feels the unforgettable night she and Sam spent together in New York is best, well, forgotten. Not an easy task when Sam shows up at Millworth for the wedding and discovers there was more to the lovely widow than he had thought. . . Apparently, Delilah subscribed to the classic philosophy that the best defense was a good offence. Again, he stifled a smile. The woman might well be just as interesting when she was annoyed as when she was flirtatious. Although she had been delightful. “A momentary error in judgment,” she said firmly. “A mistake,” he said just as firmly. But this isn’t the first wedding to be held at Millworth and it certainly won’t be the last. 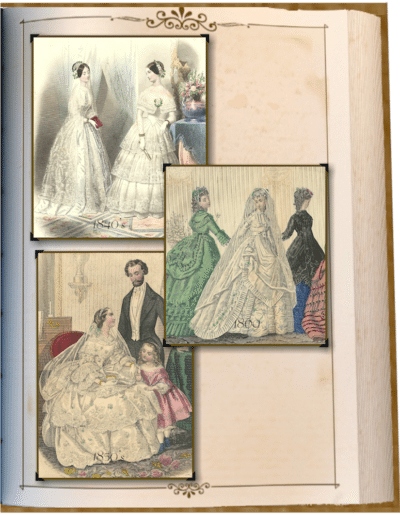 Take a look at the Millworth Manor scrapbook of bridal fashions through the years. Camille and her twin sister Beryl have never been close with their younger sister, Delilha. But they are working on it. And when Camille tries on her gown, well, it’s a special moment for the sisters . 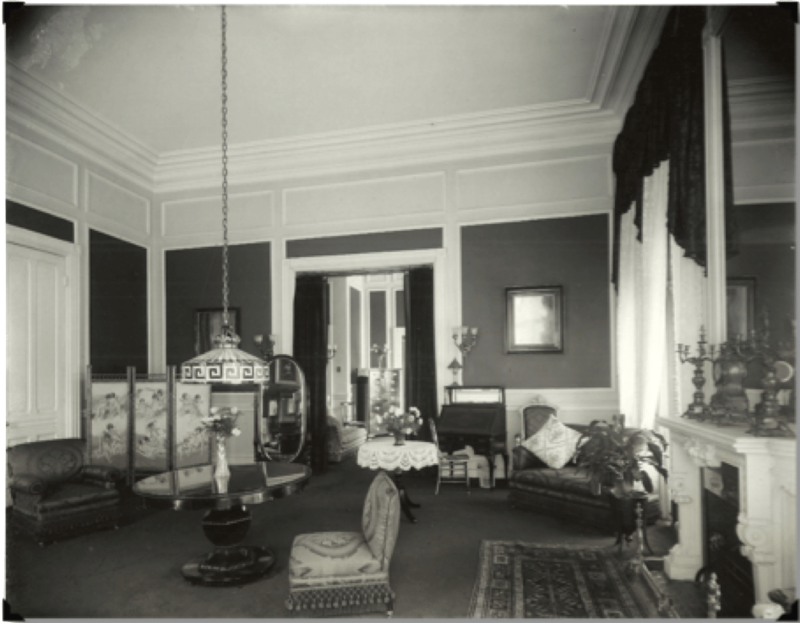 . .
A scant half an hour later, Camille stood in the sitting room all three sisters had shared in their youth. A tall mirror had been brought in from a dressing room and reflected Camille in the gown she would wear when she promised to share Grayson’s life forever. The seamstress and her assistant stood off to one side beaming. Teddy and Delilah perched on a settee and stared. The gown fit like a kid glove and the overall effect was one of perfection itself. Mr. Worth had outdone himself. The gown was magnificent, trimmed with ecru colored lace and edged with tiny pearls. Peach colored satin rosettes, as perfectly crafted as if they were real roses, were gathered on either side of the waist and trailed down the back of the gown. As a widow, Camille would never wear white but the blue silk was perfect for her. 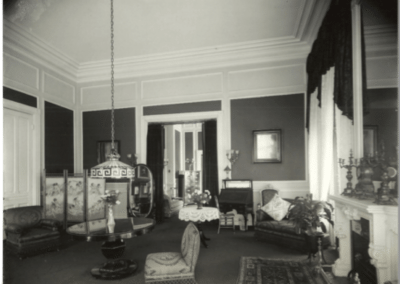 The color was a pale version of the blue of Camille’s eyes. A small diamond broach that Mother had worn when she had married Father was pinned to the center of the bodice. With the fair color of Camille’s hair and the deep blue of her eyes, her sister was every bit as magnificent as the gown. 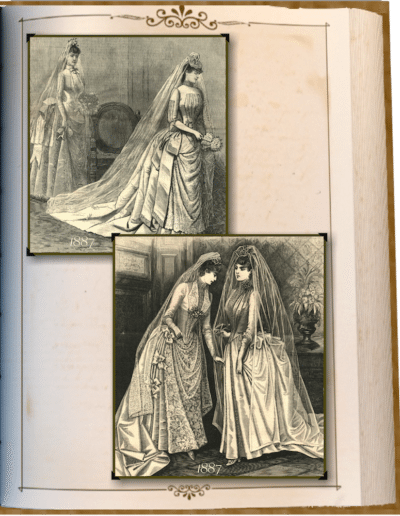 For a moment, Delilah was again a young girl staring at an beautiful older sister in a glorious ball gown who, on those rare occasions, didn’t mind the presence of a younger sister. Then she never would have cared what Delilah thought. Now, well, now was different. Delilah nodded and choked back what felt suspiciously like a tear. “I’d like that.” Teddy smiled. 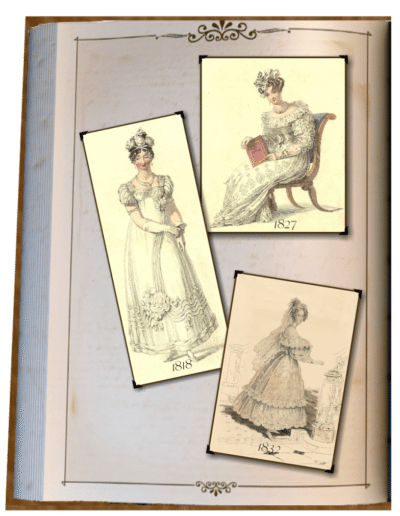 “Apparently, there’s nothing like an exquisite, expensive Paris gown to bring sisters and friends together,” Delilah said wryly.